The one that’s been there since last year? Without even a smidgeon of fear. You know that old bit of Brie – next to the Cheddar? Yes, that bit that’s leaked – that’s the one. And eat it with out-of-date butter or Clover. 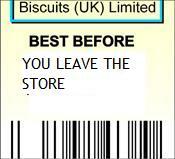 Now that the eat-by date has gone. The ones that have gone green? Yes, there. Now the best-before date isn’t there.